I was first properly introduced to Thai cooking when I lived in Boston many years ago. While I was familiar with other Asian cuisines such as Chinese, Korean, Vietnamese, and Japanese, I had not tried much Thai food beyond a bowl of Pad Thai. There was a great take-out only Thai restaurant not far from my apartment in Brookline, a suburb of Boston, where I would often pick up Pad Thai after work. It was so good at that tiny little whole-in-the wall, I never bothered to order anything else, except for maybe basil rolls, and that was just an excuse to eat the peanut sauce. It was when I went to lunch one day with a friend at the King & I on Charles Street (near Mass General Hospital), I decided to venture beyond the Pad Thai and see what I had been missing. We ordered several dishes, but the most memorable was a stir fry chicken dish impressively served in a pineapple half. What a surprise; the exploding combination of flavors brought to life all five sensations of taste on my palate with the sweet, salty, bitter, sour, and umami. These flavors became every bit as addictive, and even more so, than my weekly Pad Thai. I’ve hosted and attended Thai cooking classes since that time and eaten at many Thai restaurants, but I’ve been most impressed with the recipes from an older cookbook I purchased not long after moving to Atlanta, The Best of Vietnamese and Thai Cooking by Mai Pham. Mai owns the award-winning Lemon Grass and Star Ginger restaurants in Sacramento, California and the recipes I’ve made from this book capture the essence of the Thai flavors that I crave. The hubs will no longer order Tom Yum Soup out (I have to prepare it at home) and my favorite dish, Thai Green Curry with Chicken, from the book, is so simple to prepare and is just spectacular. Even when made with a store-bought curry paste (buy an imported one at an International market), the flavors are spot on and bring me back to the first time I ever tasted Thai food and why it is so addictive. I made two changes to this recipe: I added in 1 cup of sliced Japanese eggplant (since that’s the way it’s served at some of our favorite Thai restaurants); and since fresh bamboo shoots are not always available, I used one small can of bamboo shoots that’s been drained, in place of the fresh bamboo shoots. If you can’t find kaffir lime leaves, you can substitute fresh lime zest and juice, but a good green curry paste should be prepared with kaffir lime peel, so you won’t miss the additional kaffir leaves. Just add more curry paste, to taste. (I couldn’t find any kaffir lime leaves in town when I prepared this and it was equally as tasty.) If you prefer, you can also prepare your own homemade green curry paste. There’s a recipe for homemade curry paste in Mai’s book. 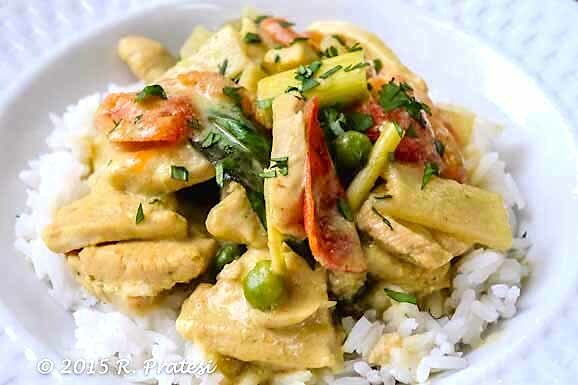 Next time you have the craving for Thai food, instead of calling for take-out or running to your favorite local Thai restaurant for dinner, try the Tom Yum Soup recipe and Thai Green Curry with Chicken. You might never want to eat Thai out at a restaurant or order takee-outee again. Heat 1/3 cup coconut milk in non-stick fry pan over moderate heat until bubbly and hot. Add the curry paste and stir until fragrant, about 1 minute. Add the chicken stock, fish sauce, sugar, turmeric, and lime leaves. Bring to a boil. Add the chicken and cook until it turns white, 3 to 5 minutes. Reduce the heat to low. 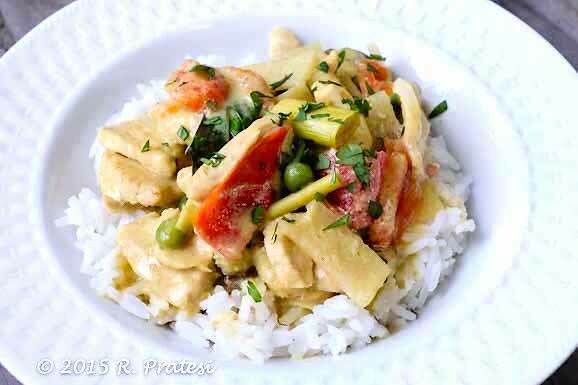 Add the remaining coconut milk, bamboo shoots, Japanese eggplant (if using), peas, and tomatoes. Continue to simmer until vegetables are heated through, about 3 minutes. Do not allow coconut milk to come to a roiling boil. Remove from the heat and add basil. Garnish with cilantro, if desired. Serve immediately with steamed jasmine rice. 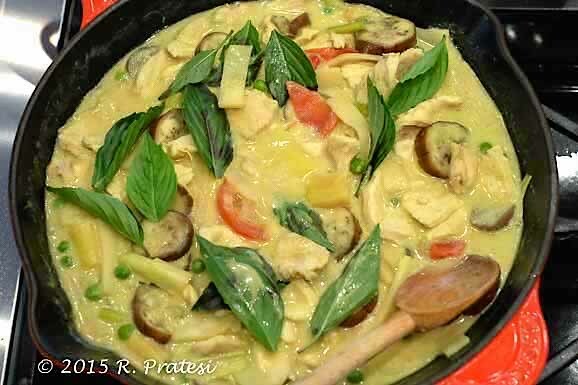 Gwen Pratesi, your Thai green curry with chicken looks so good, it’s so yummy. I’m not good at cooking but always try to cook for my family by myself, sometimes I search some cooking videos to learn, sometimes get a cooking book at a bookstore, Thanks for the recommendation of The Best of Vietnamese and Thai Cooking by Mai Pham, I would look for it.